Advanced patent-pending card alignment technology, front loading digital electronic office and small machine shop employee time clock. One Year Factory Replacement Guarantee. The all new 3600ss Time Clock sheds new light on perfectly aligned time card punches & document stamping with the exclusive Smart Site technology and no employee limit. This revolutionary patent-pending technology uses an internal vivid LED alignment guide & a bird's eye viewing window to guide each user & take the guesswork out time card punching & document stamping. An adjustable side loading time card & document feed accommodates single or multi sheet thickness. 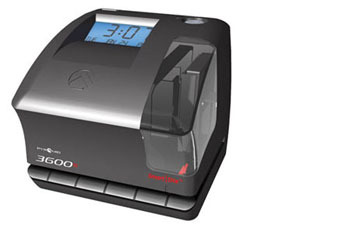 This time clock uses accurate dot matrix printing to automatically print year, date, time, 14 very useful selectable messages and 2 lines of custom type in 3 different languages (English, Spanish, and French). It features 2-minute setup and has an auto-punch feature, for easy single-hand (Right or left) operation. This multi-purpose unit is ideal for managing employee payroll/ time & attendance, along with stamping special messages on documents such as incoming and outgoing mail. The counter mode enables sequential page numbering up to 1999 consecutive stamps.